The Washington, DC-based Gallaudet University has historically offered the vanguard approach for meeting the academic needs of its students who are deaf and heard of hearing. Vital to communication, the advancements in computer technology and internet-based applications made it necessary for the Harkin Computer Lab’s administrators to develop a new, progressive vision in furniture design and space planning layout, finding collaboration partners with SMARTdesks designers and product engineers. Collab iMac conference tables give more room and more privacy. SMARTdesks recently designed and implemented a comprehensive new computer lab design for this prestigious, Washington D.C. University. Today, Gallaudet University’s updated Harkin Computer Lab has no higher peer in meeting the varied academic and resource needs of its student body. The update was necessary, after over a decade of the previous design’s service life, to keep pace with the advances in technology and communication methods. Federally chartered in 1864 under the Lincoln administration, Gallaudet University’s longstanding mission is to provide the intellectual and professional advancement of deaf and hard of hearing individuals through American Sign Language and English. Its programs and teaching methods prepare Gallaudet students to succeed in a highly competitive, technological and changing world. SMARTdesks upgrades to the Harkin Computer Lab fit with the university mission with the overarching goal to “future-proof” the facility through classroom design ideas that offer flexibility to accommodate ever-changing technologies. The Technology Services Team at Gallaudet visited the nearby SMARTdesks showroom in Linthicum, MD, and started a collaborative dialog with company president Jeffrey Korber. It soon became clear that SMARTdesks computer lab furniture offered the communication tools and learning platforms the school sought. At the meeting, the Gallaudet faculty and IT specialists employed an interpreter who used American Sign Language in conjunction with a conference room phone and a computer station webcam. All of these technology supports were already readily available for use in the Piano™ computer conference table at the SMARTdesks showroom. Additionally, the arrangement of the table and the space made it easier for the hearing and deaf participants to converse. Because of the low profile monitor placement in the table, meeting participants could easily communicate through direct eye contact and easily visible sign language motions while the interpreter facilitated communication for the group. Witnessing this communication was vital for the SMARTdesks team to begin visualizing a comprehensive, communication-friendly lab for Gallaudet University and design a classroom. The SMARTdesks team was invited to the Harkin Computer Lab to see the space and to further understand the students’ and educators’ needs. While Gallaudet educators had resourcefully optimized their space, it became evident that the classroom designs were dated and not operating to full potential. The outdated design had rectangular computer desks arranged in long rows, creating a congested feeling. The original design philosophy was going for privacy, damping visual background noise for use with web cams and the use of signing communication. A wall of private booth structures was originally constructed, which proved to be restrictive—not large enough for even two people to share, let alone larger groups. This structure had to be replaced with a more open collaborative approach. The table for the teleconferencing room was originally made by mitering rectangular tables into a U shape with a circular saw. The inventive approach fell short on aesthetics and did not address wire management. 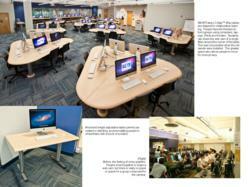 The Gallaudet team recognized the SMARTdesks Piano™ as being the completely realized conference table design solution. After assessing what ergonomic and spatial updates the Harkin Computer Lab needed, the SMARTdesks Design Team began its unique process of design collaboration. SMARTdesks enjoys a virtual office corporate culture, whose members are geographically distributed across the United States. Comprised of professional interior designers, engineers, and factory production managers, the team routinely communicates using the SMARTdesks Design Cloud. Using this platform, SMARTdesks members and the customer can communicate and share ideas, classroom floor plans, and CAD/CAM files in one convenient location on the SMARTdesks Design Cloud. Gallaudet University and SMARTdesks project managers easily upload and share documents, drawings and support information—all organized within the project as a conversational thread, fully archived, including time stamps on every upload. The Design Cloud made working with the members of Gallaudet a smooth experience for both company and client because much of the project-based communication was written and expressed graphically. Design Cloud allowed the Gallaudet team to communicate internally with constructive input from SMARTdesks, which ultimately led to the final consensus-built design. In production, Design Cloud helped managers keep the process on track for completion within the expected schedule. 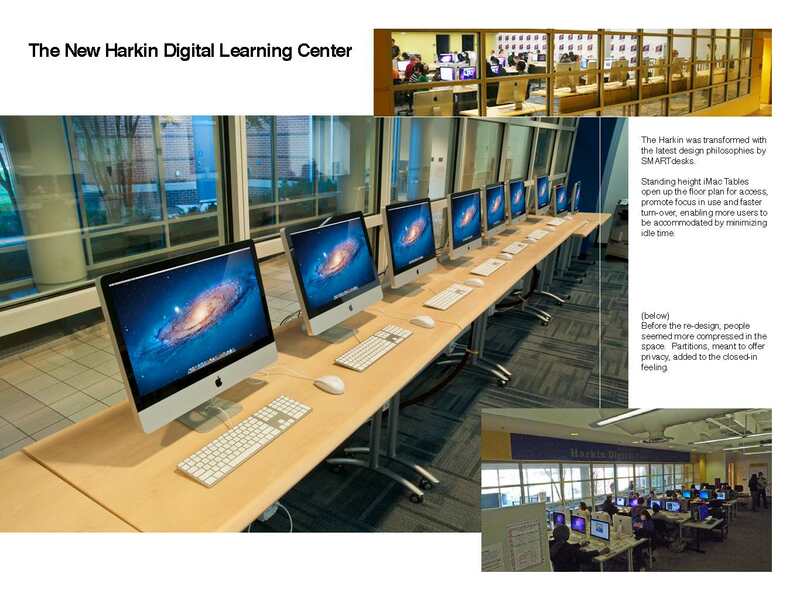 The accepted design opened up the main space for the Harkin Digital Commons. Instead of linear rows of computers, triangular Collab® Computer Conference Room Tables provided a more open plan, inviting informal assembly of work groups. With their equilateral design, the aisleways created by the shapes offered easier access to computers and data power/connections. The broad aisles conformed to Americans with Disabilities Act (ADA) regulations for access everywhere in the space. When communicating in small groups, students could now select a corner of the table to congregate around and spin an iMac into position to share the centrally located webcam. Additionally, small study carrels were no longer necessary for one-on-one interaction through webcams; the lines of the iMac computer desk offer personal computer space when preferred. The larger aisleways replaced the cramped booths, providing enough physical space to enable larger groups to sign, allowing communication to take place— the greater space reduced visual noise better than walls. Each webcam is positioned to focus on the main user; users at other computer stations face the opposite direction and their signing is blocked from sight, allowing body language to bring focus to the learning environment. With open space, flexible group arrangement, and one-to-one privacy, the new computer lab was a success. Cable management presented a significant challenge for Gallaudet’s team. 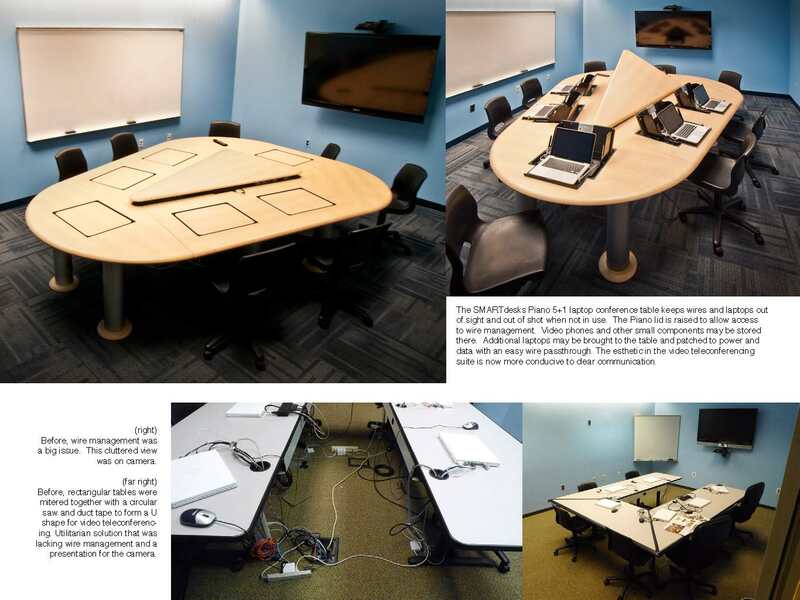 The University’s raised access floor allowed power and data to be routed under the floor, but this did not address the unwieldy snarl of cables that spilled from the back of each table. To remedy this, the SMARTdesks Collab® conference table design offered a large 18 inch diameter center column for routing power and data cables from the floor to the technology in the table. A large hatch on the column provided ready IT access and routed power and data from the access floor to the base of the table. The visual clutter vanished. Next came the challenge of power/data connector boxes for their furniture. The existing connector boxes opened to a small trough without sufficient room to plug in laptop power transformers, and the Gallaudet technology team wanted receptacles accessible from the top, but presented in an unobtrusive way. SMARTdesks and Gallaudet designed a fixed, decorative cap where simple power/data boxes could be mounted. The SMARTdesks connection boxes Gallaudet selected are usually mounted under the table, but after conferring on design, all parties agreed that mounting them in a central position behind the iMac® screens would be visually quieter. SMARTdesks designed this modification especially for Gallaudet. With all of the triangular tables in the room, Gallaudet still needed some rectangular tables with built-in wire management. A line of SMARTdesks Nesta™ computer tables was placed in front of the Harkin’s glass wall. This placement opened up the room, showcased the computer technology available to passers-by, giving easy access to the iMac® computer stations. The lighting from the windows set up an aesthetic backdrop for the built-in web cams. Because studies have shown that people perform better and experience increased focus when standing, students work at these stations while on foot. Those who wished to sit could do so at the Collab® tables. Because churn rate is high in this area, the idea of standing for a short, focused time proved to be a practical way of giving greater access to more students. Placed at the ends of this arrangement are Cirrus™ Series motorized adjustable height tables. These tables quickly adjust with a touch of a button to accommodate a variety of users and working styles, not only for people in wheelchairs. Cirrus™ adjustable height tables are often used as computer podiums, available with ratchet adjustment, spring pin and floating counterbalance. Gallaudet selected the motorized version. It is not only adjustable with the press of a button, but heights can also be stored in memory to accommodate those who return on a routine basis. Harkin’s teleconferencing suite also needed a complete redesign. The walls featured large whiteboards, a large video display and a single camera. A cluttered U-shaped arrangement of rectangular tables was unsightly on camera. While the U shape was better than a standard rectangular conference table, with its parallel sides that blocked some users from the camera, SMARTdesks triangular Piano5™ Conference Table placed all in the camera’s angle of view. The new table design also offered a wire management solution as well as a collaborative shape for telepresence, and a secure place to store laptops when not in use. The Piano’s unique geometry and scale worked well as a laptop table for the unusually shaped room. Six flipIT Laptop Safes® were added to store the laptops securely when they were out of use. Gallaudet’s MacBooks securely stow under the flipIT’s locking lid. The laptops remain connected to power and data while in use or when stowed. The profile of the lid is lower than the laptop screen, so participants can communicate without visual obstruction. The Piano’s hinged lid and technology well neatly hide wires and small components. The result: a clean looking studio set that frames people’s faces for visual interaction in the room and on camera. The Harkin Digital Commons Learning Center has proved a resounding success for the students and faculty. Due to the upgrades to the facility, the room is always near capacity with negligible down time. The excellent design reflects a synergistic collaboration with the SMARTdesks team and Gallaudet University’s commitment to create the foremost learning environment for people who are deaf or hard of hearing. SMARTdesks Piano5+1 Laptop Teleconference Table shows people clearly on screen and on cameraSMARTdesks Piano Conference table used for VTC Stand up to the iMac and get things done with focus.SMARTdesks Nesta flip top tables are at standing height to promote access.